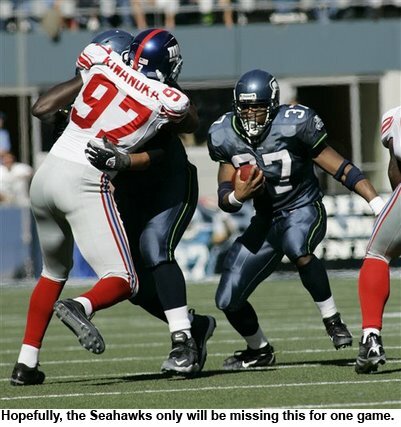 Today's announcement that Shaun Alexander has a broken bone in his foot merely confirms what I've suspected for a couple of weeks: That his foot was bothering him a lot more than he was letting on all along, and was, in fact, the biggest factor in the running game's woes this season. 1-2-NYG2(12:44) S.Alexander up the middle for 2 yards, TOUCHDOWN. 1-10-NYG47(10:49) S.Alexander left tackle to NYG 43 for 4 yards (A.Pierce). 3-2-NYG39(9:44) S.Alexander left guard to NYG 27 for 12 yards (G.Wilson). 1-12-NYG12(7:42) S.Alexander right tackle to NYG 12 for no gain (B.Cofield). Added up, that's four carries for 18 yards and a touchdown. That's 4.5 yards per carry -- the kind of numbers we've been used to seeing from Alexander. Those four carries showed me that he was feeling pretty good up until then. His touchdown run was a hard run right into the heart of the defense, while the 12-yard gain was vintage Shaun Alexander -- taking a third and two run and turning it into a big gainer. He looked strong and aggressive. 2-10-NYG27(5:44) S.Alexander left tackle to NYG 26 for 1 yard (A.Pierce, M.Strahan). He carried the ball 15 times after that run. He gained just 28 yards -- a 1.86 yard average. If the Giants were looking for tendencies -- and I know they were, since that's what coaches do -- they noticed exactly what I did: That he absolutely could not cut on that left foot without any pain, something you need to do on a run to the left. This also could also help explain why his production declined so dramatically the rest of the game. In fact, of his last seven carries, only three went for positive yards, the longest a three-yard gain. If that is indeed true, it's possible he could only miss one game, since the bye week follows this Sunday's huge matchup with the Bears -- that would give him three weeks from the day he suffered the injury to get well enough to play again. Holmgren mentioned Monday that Alexander didn't want to come out of the game when he did; I'm sure they'll have a similarly difficult time keeping him off the field in a couple of weeks. In the meantime, I'm sure Maurice Morris will do a capable job as his replacement; there's even a line of thought that Morris is a better fit for the running game at the moment because of his quickness to the hole. What scares me is if anything happens to Morris, since the injuries are starting to mount up. We're one snap away from Josh Scobey being our running back, and the myriad injuries are making it more difficult to add a guy like Marquis Weeks from the practice squad. Not to look past the Bears, but in terms of the health of the entire season, the bye week is coming along at the perfect time: Besides the potential return of Alexander, tight ends Jerramy Stevens and Itula Mili should both be ready to return to full-time action, as should guard Chris Gray. If the Seahawks can somehow figure out a way to beat Chicago -- on the road, no less -- they'll be playing with house money on their way to home-field advantage once again.